I have to order a couple of these for our entrance doors. They are stickers that let the firefighters know what you have some fur children that need rescuing. You can get generic ones that alert the fire brigade that you have a number of pets, or you can get specific ones that list their breed, the number of pets, and they are all made with reflective material so they stand out when a flashlight or floodlight shines on them. I’m not an affiliate so I don’t make money off the link, I just want to bring awareness to the issue. While the order might vary by department, the basic premise is that firefighters prioritize life safety, fire suppression, then property protection; but there are some great stories in the news of firefighters saving kittens, and puppies. Here are some pictures. If the fire is small, and human lives are saved they may be able to safe our pets given the situation. Providing awareness to them that pets are in the home gives them one piece of knowledge and might result in many more years with your pet after a disaster. (c) ABC News. 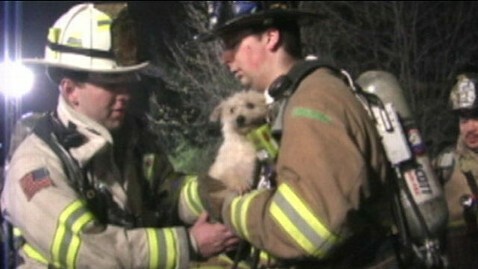 New Jersey firefighters rescue a puppy in distress. Click for the story. This entry was posted in Uncategorized and tagged awareness, fire, safety, stickers on December 12, 2014 by dexterkelly.